"The entire lay leadership of the Anglican church in Iraq is missing and feared dead after being attacked on a dangerous road west of Baghdad. The five Iraqis were last heard from on 13 September when they reported they had already being attacked travelling on road between Ramadi and Falluja. 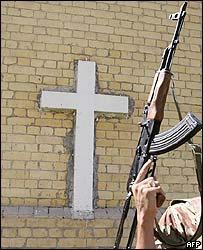 Church officials had kept silent about the matter while US forces did checks, but there has been no sign of them."